Executive Producer, Geoff Keighley took the stage at E3 during Bandai Namco’s presentation as he went on to announce the new Soulcalibur VI, along with other titles. Unlike many other companies, creating hype for their upcoming games, Geoff jumped right into the story of the game, what it revolves around. SOULCALIBUR VI Collector’s Edition: it will feature a 12” Sophitia Figure, 120-page Art Book, Metal Case with Built-in Soundbox, Soundtrack CD, Collector’s Edition Box, and the full SOULCALIBUR VI game. It would be priced at $149.99. 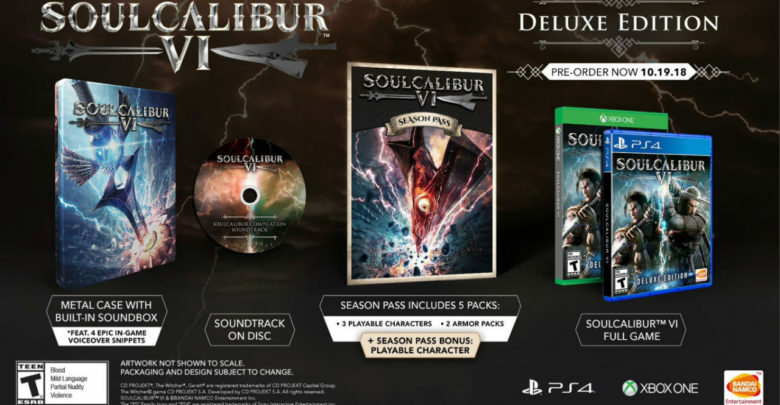 SOULCALIBUR VI Deluxe Edition: it will include the Metal Case with Built-in Soundbox, Soundtrack CD, SOULCALIBUR VI Season Pass, and the full SOULCALIBUR VI game. It would be priced at $99.99. The game is set to launch in the Americas on October 19, 2018 for PlayStation 4, Xbox One and PC on STEAM.